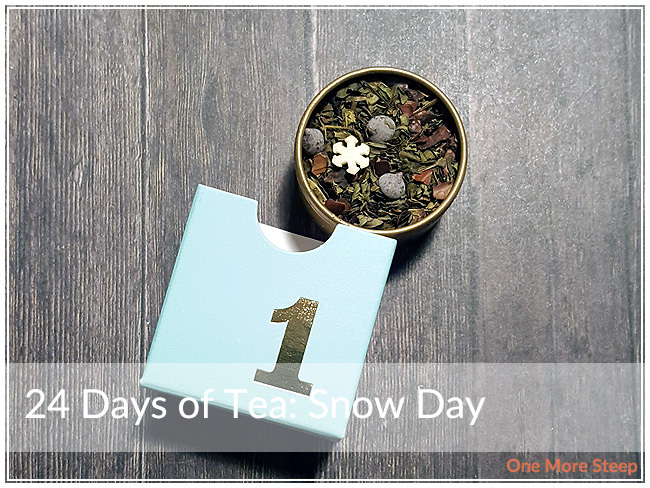 Day 1 of DavidsTea’s 24 Days of Tea advent calendar for 2016! I received this calendar for my birthday in November, there are some still available in stores and online (the calendar retails for $40). Each day has a different tea in a gold tone screw-top tin. There’s probably enough in tea tin for 2-3 cups of tea, depending on how much you use per cup and also it depends on the tea. Some blends have more heavy ingredients or bulkier ingredients that just take up more space. Snow Day was around last winter, I know this because I received a tin of it for the holidays as a present. If you haven’t tried it before, Snow Day smells like mint chocolate. It reminds me a lot of how mint chocolate ice cream or After Eights candy smells like. There are mini chocolate chips, and cute little snowflake sprinkles. It’s a really cute tea and really nice to look at! The ingredients of Snow Day are: peppermint leaves, cocoa beans, cocoa husk, chocolate drops, white chocolate pieces, sugar sprinkles. DavidsTea recommends steeping Snow Day in “near-boiling” water (90-95°C / 194-203°F) for 4 to 7 minutes. I steeped for close to 4 minutes. Because of all the chocolate drops/pieces and sprinkles, Snow Day does have an oily film on top that can be a little bit off putting to some people. The hazards of having chocolate in tea! I find that this tea smells very strongly of mint after it’s steeped, and the chocolate plays sort of second fiddle to the mint but it is still very noticeable. The mint taste is heavy compared to the chocolate, much like how it smells, but the chocolate is still present. The tea is sweet and overall has an oily mouthfeel to it. However, it isn’t off-putting to me. While Snow Day does taste good straight, I do add a little bit of evaporated milk and that just gives it a creamier feel to it. I find that it is sweet enough without added sweetener. I generally do not resteep herbal infusions, Snow Day was not an exception to the rule. 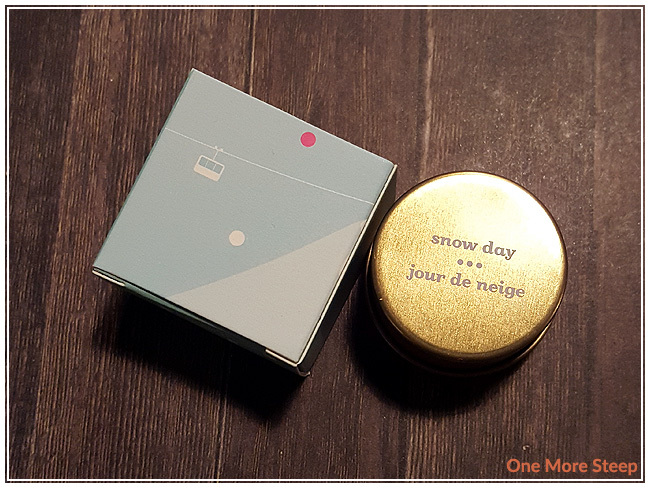 I loved DavidsTea’s Snow Day. 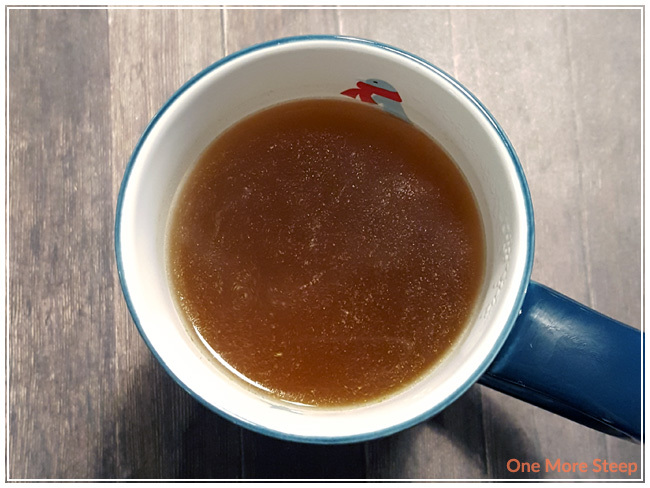 I’m not generally a fan of herbal infusions as I find that they often don’t taste as good as they smell, but I do like Snow Day quite a bit. I think it’s the comforting and familiar combination of chocolate and mint that really does it for me. I like that it’s an herbal tea though, which means non-caffeinated so I can drink it at all hours of the day. Shift work tends to throw me off, so I do need to watch what I drink and when, but this is an ‘any time’ drink for me.